1. The Kentucky Society of Professional Geologists; September, 2003, Field Guide to The Middlesboro Impact Structure and Beyond, by Kuehn, Milam and Andrews. Field Guide to Middlesboro and Flynn Creek Impact Structures, by Milam, Evenick and Deane. Other contributors and associations are noted on those locations. To view lines move cursor over photo. This circular feature is found in Middlesboro Crater in Eastern Kentucky on an excavated slope that is the property of Faith Missionary Baptist Church, . A pre-excavation photo can be seen infigure 43, Stop 6, KSPG, and figure 12 , Stop 5 in the UTK field guide. The view is looking southeast. The small hardwood tree directly over the person in the above photo is the same tree that is directly over the front pickup fender in the tour photos. Circular and semi-circular (CSA) features are found throughout the Middlesboro area. Smaller circular feature in the bank just to the right and below the above circle at Faith Missionary Baptist Church. Smaller circular features in the bank directly below and left of the circle in the top photo. This cut bank is at Roselawn Memorial Gardens in northern Middlesboro, just above Stop 9 on the KSGP tour, Stop 8 on the UTK tour. The view is looking east. This aerial photo shows the feature highlighted in the upper photo. 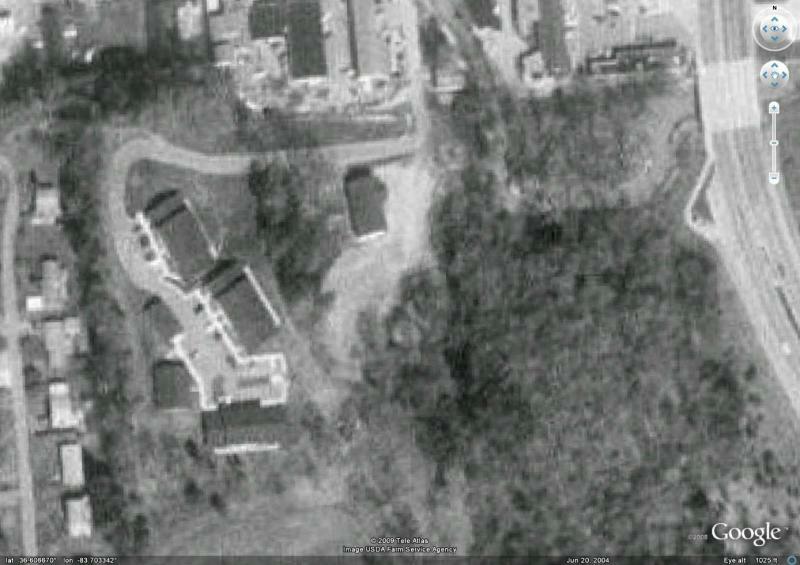 Faith Missionary Baptist Church building, Stop 6, KSPG, can be seen just above the circle. This photo shows the property before the slope was excavated for construction. This Lee conglomerate outcrop is the site where in 1966 Robert Dietz found shattercones. It is listed as Stop 5, figure 40 on the KSGP tour, UTK tour Stop 4. The location is on the Middlesboro Golf Course adjacent to the club house and the first tee. The view is looking south toward the club house. The concrete retaining wall shown in the KSGP photo is just visible in the upper left corner. A closer lookat Dietz's Lee conglomerate outcrop. The view is oriented with south at the top of the photo (toward the club house). The rock shown in this photo is adjacent to the Brunton in the above photo. Move Cursor over images to highlight circular patterns. Allow page to load completely.